Russia’s State Space Corporation Roscosmos will support the Sea Launch project and adapt its new Soyuz-5 medium-class carrier rocket for launches under this program, a source in the domestic space industry told TASS on Thursday. "Roscosmos is ready to support the development of the Sea Launch project and adapt the Soyuz-5 rocket for its launch from the floating Odyssey platform as part of this program," the source said. S7 Sea Launch Limited and the Ukrainian Yuzhmash manufacturer signed a contract in April 2017 on the production of 12 Zenit carrier rockets for the Sea Launch project. Two of the rockets are already in the process of their production. According to the plans of S7 Space, the first launch under the Sea Launch program is scheduled for December 2019 while three launches are planned for 2020, four launches in 2021 and four in 2022. As a whole, S7 Space expects to perform up to 70 commercial launches over 15 years. As was reported earlier, S7 Space (part of S7 Group) is developing its own reusable rocket based on the conceptual design of the Soyuz-5 carrier (being developed by Energia Space Rocket Corporation). The company has dubbed the new rocket "Soyuz-7" and "Soyuz-7SL" (Sea Launch). 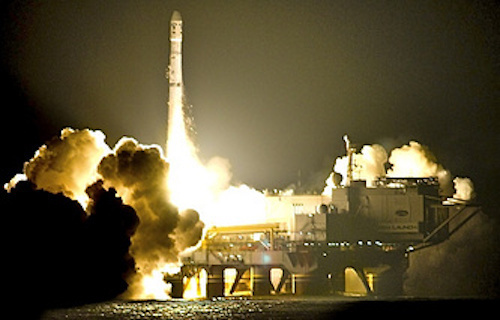 S7 Group is the owner of the assets of the Sea Launch rocket and space compound where 36 launches (including 32 successful) were carried out by the end of May 2014. The sea compound comprises the Odyssey floating launch platform and the assembly and command vessel where rockets are assembled and control of pre-launch operations is exercised. The vessels are based in the state of California, the USA. The launches are carried out from the equatorial Pacific near Christmas Island. The compound’s space rocket component comprises the Russian-Ukrainian Zenit-3SL carrier rocket and the Russian DM booster. The rocket’s two stages are assembled at the Ukrainian Yuzhmash enterprise, although 80% of its components are made in Russia. After their manufacture, the rocket stages are transported by sea to the United States where the rocket is finally assembled. The Soyuz-5 medium-class rocket is being developed by the Energia Space Rocket Corporation. Roscosmos earlier approved its conceptual design. The Soyuz-5 carrier can be used to deliver the manned Federatsiya spacecraft into a low near-Earth orbit. The Soyuz-5 rocket is expected to be created by 2021. Its four launches are planned in 2022-2025 as part of its flight tests.